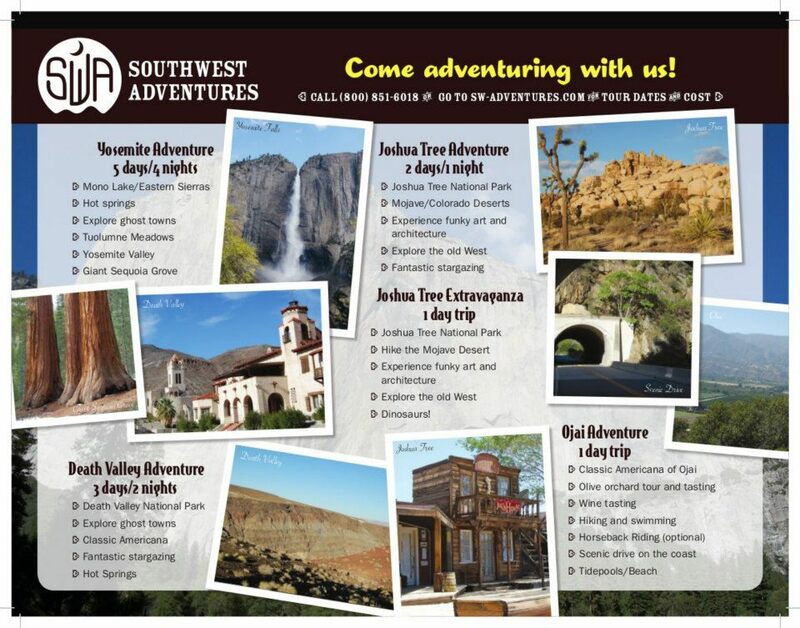 Fun, Hassle-free Group Travel, Singles Travel, Family Camping, and Nature Hiking - Come adventuring with us! What's an Adventure Tour like? Although your group leader will send you trip details, and tell you on the first day of your trip, here's some general information to get you started! Our goal is to show you some of the most amazing places in the United States, and make sure you have fun on your Adventure Tour! We handle all the camping reservations, entrance fees, supply most of camping gear, and help plan/cook the meals. Basically, we take the stress out of planning your vacation so it actually feels like a vacation! We take you to some of our favorite places in the world and we want them to be some of your favorite places as well. 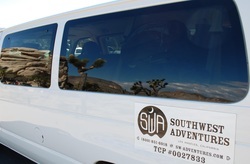 Each tour is designed to give you a taste of each place, from climbing on giant boulders in Joshua Tree, to experiencing the daily miracle of a sunset in the Grand Canyon. But a trip is more than just hiking and sunsets, right? We take great pride in the food we make on our trips. All meals are prepared on campsites are included with your reservation, but bring some extra cash for any off-site meals at restaurants. While your guide takes lead in meal preparation, we all work together to prepare campsite meals. Everyone pitches in to help out. This makes everything much faster, and creates a sense of community. For longer trips, each Adventurer helps with 1-2 dinners. Do you have a favorite dish you'd like to share? Fantastic! You'll have a chance to share a favorite meal with the group, as well as enjoy favorites that other group members share. Not sure how to make a quiche on a camping trip? Don't worry, your group leader is there to help make food preparation move along smoothly. Never cooked a day in your life? No worries! Your group leader will help you plan and prepare a delicious meal! Be sure to check the "What To Bring" list at the bottom of your Adventure Tour. Bring your personal items such as backpacks, water bottles, weather-appropriate clothes, and toiletries. First Aid/CPR certified guide, with years of experience as a professional driver. Temperatures can range from ~20° F at night during winter to a possible high of ~115° F during the summer months of July and August. We highly recommend bringing a variety of clothing that can be layered according to the changing weather conditions you will experience on your trip. A t-shirt and shorts will be perfect for most warm days, but some nights you'll need an extra shirt and a fleece. A hat and water bottle are important for many hikes. After you secure your reservation, we'll send you a detailed list of things to bring for your specific tour, with considerations for the time of year and accompanying weather.